The feathery, flame-like floral heads of plumed cockscomb dazzle the garden and dried floral arrangements with bright, long-lasting color. Needs consistent moisture. Keep soil moist but not soggy. Flowerheads are feathery and plumelike. Propagate by seed - Start seeds indoors 4 weeks before the last frost. Cover them with soil, since light inhibits their germination. Can also be sown outdoors after the last frost is reached. Pre-started plants are often available at retail outlets. May need staking. Requires regular watering. Plants purchased in cell-packs with crowded roots may develop slowly or may not develop at all if the crowded roots stop growing. Look for varieties with different heights, flower colors, and some with reddish foliage. 'Apricot Brandy': orange flowers on 18" tall plants. �Geisha� Mix: wide variety of flower colors on dwarf (10� tall) plants. Excellent for pots. 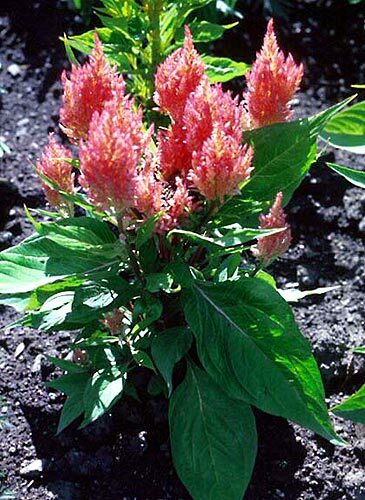 �Kewpie� Mix: very dwarf plants (8 to 10� tall) in a wide variety of flower colors. Early flowering. �Castle� Series: wide variety of flower colors. 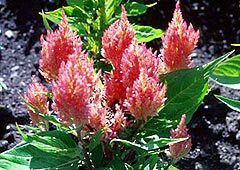 Flowers retain color much longer than traditional Celosia blooms. Very drought and heat resistant. 'Bombay' Series: variety of bright flower colors. Long-lasting flowers on early blooming, heat tolerant plants. �Fairy Fountains�: a mix of flower colors. Dwarf plants (1� tall or less). �Century� Series: 2� tall plants with various flower colors. Some have bronze foliage. Large flower heads, dense plants. �Gloria� Series: dwarf (8� tall) plants with a variety of flower colors. Compact. �Kimono� Series: very dwarf (4 to 6�) plants with dense foliage and uniform flower heads. Variety of flower colors.